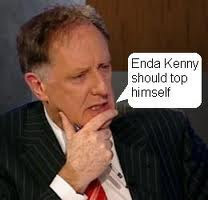 I Iike Vincent Browne. I remember him when he was a lanky lad of twenty at UCD, where he was, among other things, a leading light of the college Fine Gael party. I met him at Feile An Phobail a few years ago and confronted him with his youthful past. He hung his head in mock shame and murmured “It’s true, I’m afraid. All true”. His programme on TV3, ‘Vincent Browne Tonight’, is easily the best general election commentary you’ll find south of the border. It certainly makes its supposedly funny and slick rival on RTÉ,‘The Eleventh Hour’, look sad and flimsy. What makes the programme work? The short answer is ‘Browne’. He breaks through the polite facade of discussion to show his incredulity at much of what he hears. Last night was a good example. Fine Gael’s deputy leader Dr James Reilly (don’t forget the Doctor) was emphatic: Fine Gael had never said they’d take unilateral action in their dealings with bond-holders and Europe. Browne insisted they had: “It’s in your manifesto” he told the bearded Doctor. “No it isn’t” the ex-sawbones said. “Show me where in the manifesto it uses the word ‘unilateral’. We never said at any point we’d take unilateral action”. Other presenters would have left it at that but not Browne. He told the Fine Gale guru to pass the manifesto, thumbed through it for several minutes while Reilly obligingly rumbled on about negotation, sitting down, discussion, rhubarbrhubarbrhubard. “Here it is” Browne said, and read out the paragraph which did indeed contain the word ‘unilateral’. The overweight Fine Gael health spokesman had the grace to look flustered but only for a moment, after which he tried to maintain that ‘unilateral’ and ‘negotiated’ were the same thing. As a bonus last night the show also had a screamingly funny skit involving Browne, Fianna Fáil’s Willie O’Dea and Micheal Martin. Given that audiences fall off dramatically after 10.00 pm, I don’t know why in God’s name they push the programme back to an 11.05 pm starting point. But maybe we should be grateful for Browne at any hour, and the brain and bite he brings to political discussion. Just imagine if we had someone half as good this side of the border. Also the recent appearance of Joan Burton denying what Eamonn Gilmore stated on the Late Late show. Vincent got a script of the program and read, verbatim, Gimore’s comment’s only for Joan to deny once again. The Eleventh Hour tries to be cool/funny, Browne does it naturally by exposing the absurdity of some politicians. By the way I couldn’t watch the Eleventh Hour after the Five Leaders Debate coverage. Can’t remember ever viewing a programme so biased/ distorted.